California grows over 400 commodities that account for one-third of the country’s vegetable production and two-thirds of the country’s fruit and nut production. 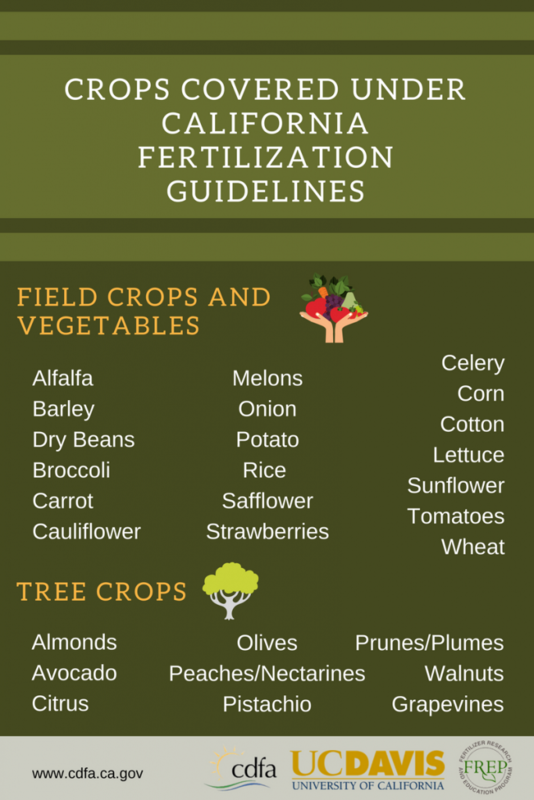 For many of these crops, there are various research and technical articles available that provide fertilization information. However, this information is often hard to find and can take hours of searching the web. It was clear that California needed a comprehensive overview of current research-based knowledge of crop fertilization. That led to the development and production of the California Fertilization Guidelines, produced in association with UC Davis. The guidelines address this need by providing a summary of relevant nutrient management research on major California crops. The guidelines were first published in the summer of 2013 and covered 16 crops. An additional 12 crops have recently been added. Nutrient management quizzes for many of the crops have also been added to the website. The guidelines provide growers and crop advisors with an important decision-making tool to help determine the right time, place, rate and source of fertilizers. They show fertilizer needs based on uptake curves for different crops, so that uptake into the plant is optimized and environmental impacts are minimized. With the addition of these 12 crops, the guidelines now provide nitrogen, phosphorus and potassium fertilization information for 28 crops covering 75 percent of irrigated agriculture in California. FREP was established in 1990 to provide funding for research and education regarding the agronomically safe and environmentally sound use of fertilizer in California.